An increasing number of broadcasters are now using switching, extension and matrix technology over IP to streamline operations and make them more flexible and cost-effective. IP-based KVM (keyboard, video and mouse) technology removes the need for traditional KVM equipment and brings real-time, accurate video operation to all areas of the broadcast operation including outside broadcast trucks, broadcast control rooms and post-production studios using the same ubiquitous IP infrastructure. By using IP-based KVM in a live broadcast control room, operators can switch from one camera shot or application to the next – seamlessly and instantly – at the touch of a button, without the need for multiple workstations in the room itself. This not only makes it easier for production teams to manage their workflow, but also helps to create a smooth transition between sections. Another benefit of IP-based KVM is that it allows for the physical machines to be removed from the control room and relocated into a secure server room. This eliminates any unwanted heat and noise generated by the machines which improves the general comfort and ergonomics of the control room. It also adds to machine lifespan and performance by ensuring that the machines are kept at a constant temperature. IP-based KVM technology can also cope with multiple types of devices, such as touch screens and USB-operated devices used by production teams for an instantaneous user experience, offering high degrees of integration from one source. Whilst IP-based KVM offers enhanced flexibility to broadcasters in the way that they manage their workflows, many believe that it is an expensive and time-consuming process that involves re-cabling, moving or adding computers, as well as changing racking due to lack of space. However, a new solution from IP-based KVM specialist, Adder Technology, will be on show at this year’s NAB to addresses these challenges with a cost-effective solution, powered by the world’s smallest high performance IP-based KVM transmitter. 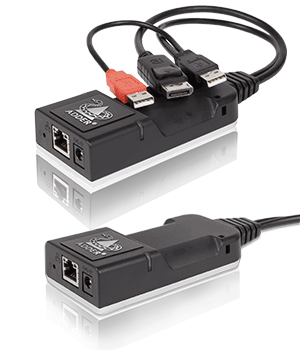 The ADDERLink 100T (ALIF100T), part of the ADDERLink Infinity solution, is a USB powered solution that can be easily retrofitted into any existing infrastructure just by being plugged into the back of any computer like a dongle, taking up Zero U if rack mounted. Highly scalable, it also enables broadcasters to grow their system over time without needing to accommodate new rack space. The ALIF100FT could well be the driver needed for many more broadcasters to migrate to IP to take back their rack and benefit from a connected and seamless control room workflow. Visit Adder at stand S4227 at NAB to discover how the small and powerful ALIF100T could support your broadcast needs.